In this story I will show you how to institute fraud in the RE market so that three quarters of idiots would fail to even realize what is happening. What is more, everything is legal, fair and without any shade of a fraud, unlike in MMM, but more like a kind of theatre. Nevertheless, the dupes are later proud that they were screwed. Like in that movie with Ostap Bender. The smallest skyscraper has a unique story. This small cabana is 3 meters in width and the quarter of that is taken up by the staircase. This cabana would not be called a skyscraper at all if it had not been costed like a skyscraper, is not built like a skyscraper and had not become one of the highest buildings in the USA*. In 1919, when the cabana was built, Texas’ villagers were amazed, because of the realization that they were defrauded like complete fools. And they really were fools, after all. Fools, who like to dream instead of orienting in reality. Fools who gave all their money to build a microscopic skyscraper. Everything began in 1912, when oil was struck near the Burkburnett village in the county of Wichita, Texas. The villagers quickly became rich; the crowds of arrivals invaded the village and in 1918 about 20 thousand people lived in this place. The villagers felt like the lords of “NaujiejiVasiukai”, whom had lots of treasures; therefore they started to think about where this money can be used. And then came some kind of architect Ostap BenderJ.D. McMahon, who suggested building the highest skyscraper in the world. The building had to be 480 feet tall. It had to turn the village to the centre of the region, where business prospers and the wealthy live. So, the inhabitants rapidly collected 200 thousand dollars (nowadays it would be 3,5 million dollars) and gave the order to build. The architect complied. It became clear immediately that the building was constructed up of 4 floor. It then became clear that in all graphics and contracts instead of feet are indicated inches. Villagers, obsessed with dreams of skyscrapers had failed to distinguish inch from feet, when they were signing the papers. The trial started, but ended rapidly, because the documents were filled correctly. It became clear that the building had to be 480 inches height. In other words, it had to be 12 meters in height, because it was indicated in the graphics, which were in turn signed by the investors. Villagers-investors were shocked. They promised to crucify the architect, but they could not do anything. It became clear that there are no staircases in the building, just a shaft of a non-existing lift. The company that promised to build a lift cancelled the contract. So the villagers who to soon rejoiced over the huge amounts of real estate had to climb the ladder from one floor to another. After some years, the oil in the village ran out and all people became tramps who have overspent their money. The money was gone. Some angry offices were located in the building and finally, a lift was installed instead of staircase. 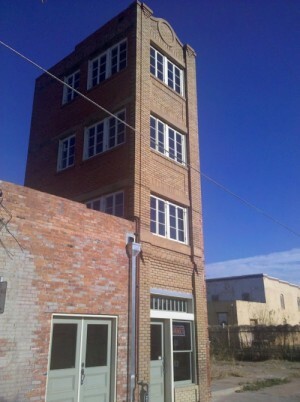 Besides, the building was so small that the staircase took a quarter of the building’s width. Total usable building’s width was just 40m2, like a width of a little flat. After 10 years, when the Great Depression occurred, the skyscraper was deserted. In 1931 some tramps set fire to it. After the Great Depression, the building was fixed, sold one time, then another time and so on and so forth. Subsequently, some owners tried to demolish the building, because it was so inconvenient and not suitable for anyone. But then the inhabitants started to resist – if they had spent a lot of money for this skyscraper, if it was so well-known, how could they demolish it? The building was not demolished, thanks to the inhabitants who saved it by making protests and threatening the owners with summary punishment. That is a story how the smallest skyscraper in the world became one of the most famous landmarks in the state of Texas. Now all villagers are proud of this skyscraper. It can be added that a very ordinary gentlemen like J.D. McMahon defrauded everyone, no mean feat. He won, because people believed in their dreams instead of believing in reality. It was obvious that a village could not turn to a metropolitan, but the villagers still believed their delirium and paid money. Finally, Mister J.D. McMahon was right and some kind a village of Texas has a famous thing. It is a monument not just for people’s idiocy but also for the price that people pay in order to make their dreams come true. * At the time, when J.D.McMahon was building the smallest skyscraper in the world, the USA Wollworth building was already built. It was one-and-a-half time higher than people of Texas expected. It was 791 inches height. Even the building of 479 inches height would have been the huge one.